This model is suitable for a variety of geometries, though each one presents its own challenges. The module is relatively easy to fold, but the assembly is moderately difficult so it is not a good model for a beginner folder. Start with a piece of paper in 1:2 proportions. If using paper with colour on one side start white side up. 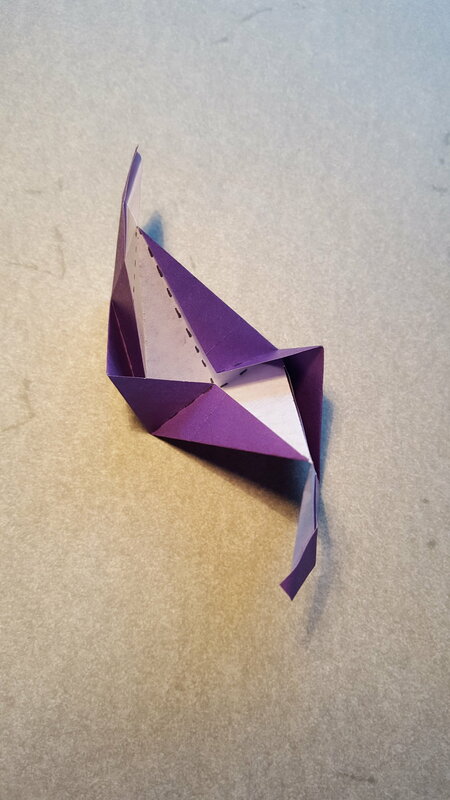 Fold and unfold the bottom edge to the top edge, only pinching the edges of this fold. Fold the top edge to the mid line which was lightly marked in the last step. 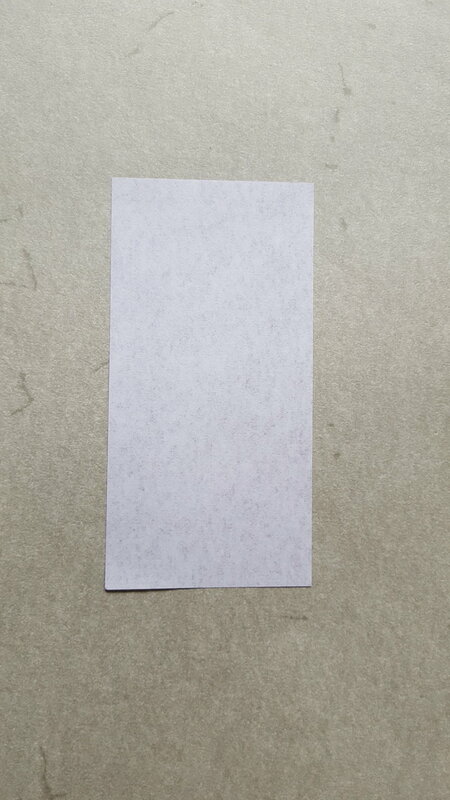 Fold the bottom edge to also meet the middle of the paper. Unfold the paper and it should look like this so far. Fold the left edge to meet the topmost fold creating a diagonal crease. Now fold the right edge to meet the topmost edge like in step 6. Unfold and rotate the paper 90 degrees. Fold the bottom edge to meet the diagonal crease. Unfold the last step and the paper should have the creases shown. Turn over and rotate the paper again. Partially fold the lower horizontal crease. Pull this folded crease to meet the diagonal line and crease the paper underneath. Note this little coloured triangle. Bring this down which unfolds one crease. This is where the paper will end up. 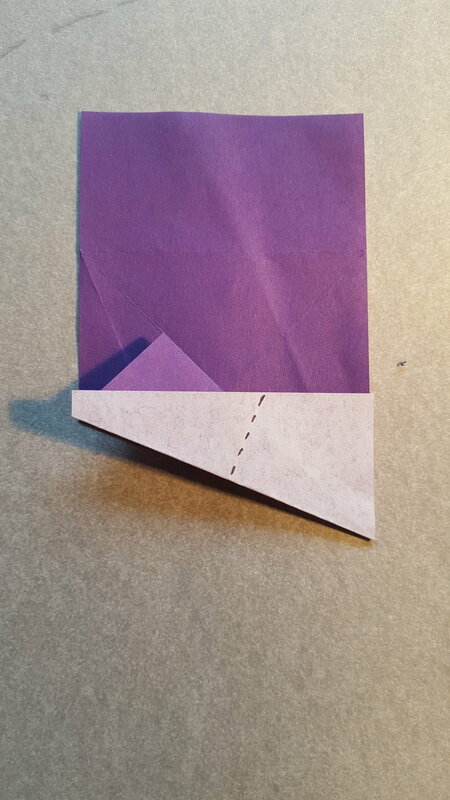 Fold the bottom diagonal edge to meet the folded paper. Unfold the paper and you should have these three creases. Repeat steps 10-19 on the other half of the paper and return to the white side of the paper. Fold the left edge so that the bottom edge lies on the diagonal line. 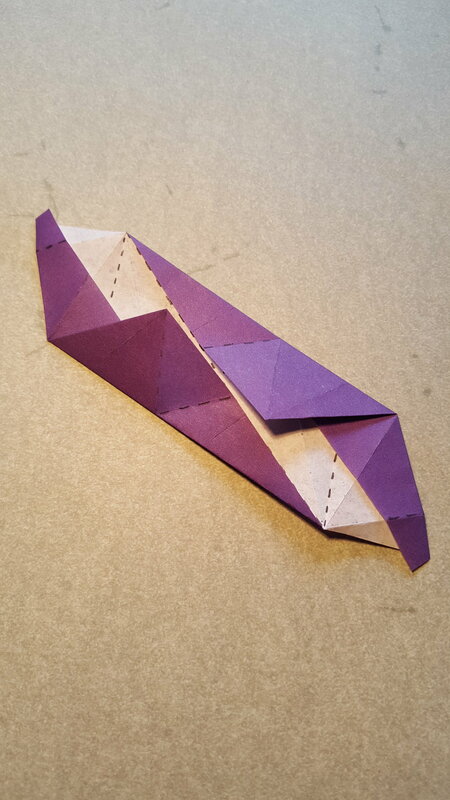 All 3 folds on purple side should match up with a fold on the white side. 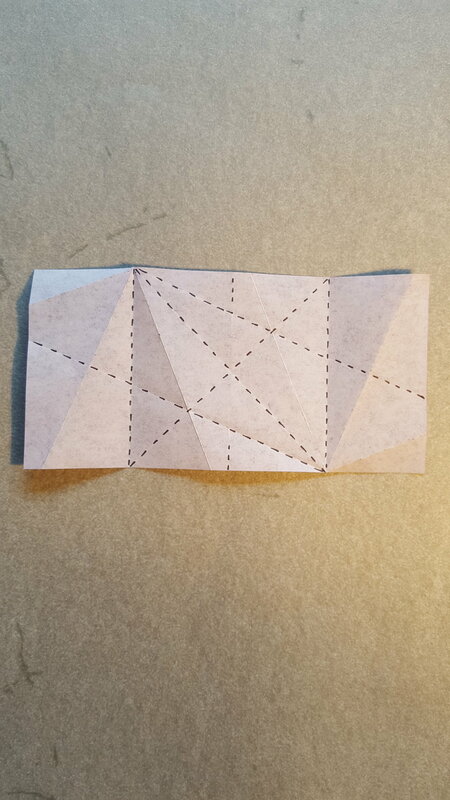 Fold the bottom edge to the diagonal line along existing creases. Reinforce the two mountain folds near the top left corner of the paper. Rotate the paper 180 degrees and repeat steps 21-23 so the paper now looks like this. 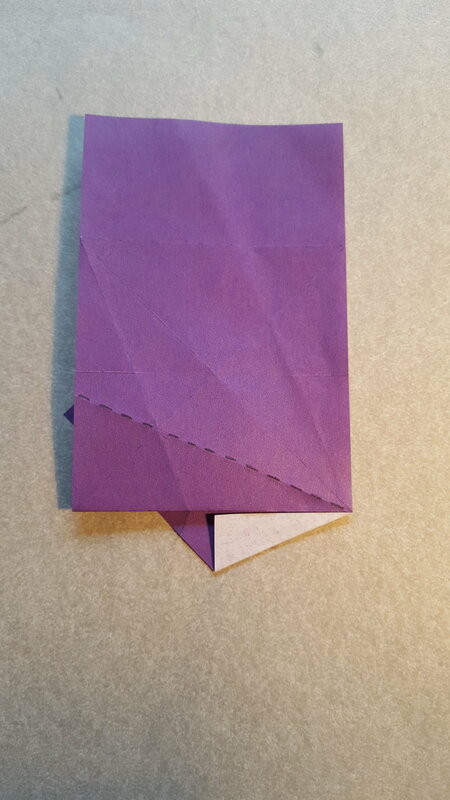 Begin to fold the other diagonal, but let the excess paper rise up along the existing creases. Also fold along the mountain which can be seen folding here. Fully flatten the folds in the last step and the model should look like this. Stretch out the paper a little and one unit is finished. This is how you connect the units. Choosing a geometry is difficult as they all present challenges. The modules are quite tight so forming a three unit pyramid (like in the third picture) is tricky, but once formed it is very stable. 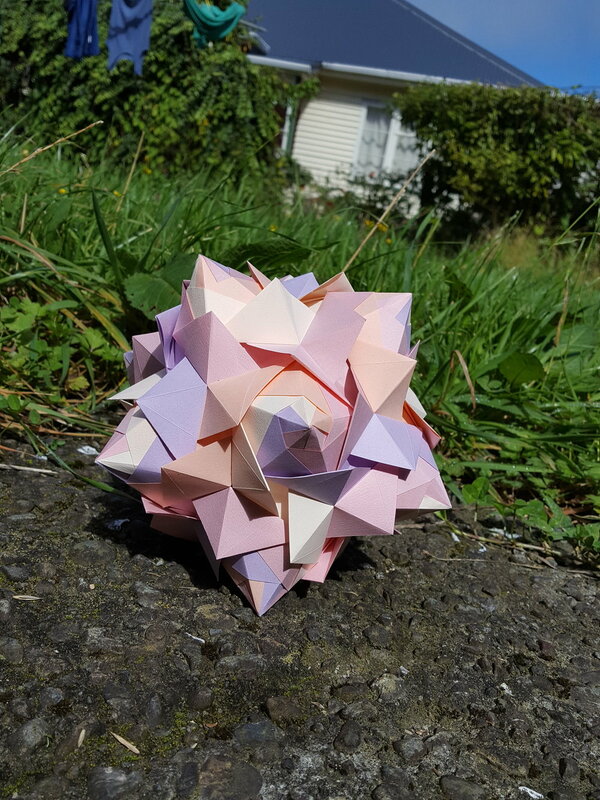 On the other hand if you go for a dodecahedron and form five sided mountains then they are easy to put together, but they also come apart more easily. You will need to use mini clothes pegs or paper clips while assembling, but it is stable once complete. It should also be possible to make a 90 unit version, but I have not tried that yet - proceed at your own risk!